Terry Gou is CEO of electronics manufacturer Foxconn. He’s also a big proponent of replacing humans with robots in factories. Gou said Foxconn would replace human workers with a million robots in three years. That was three years ago. Since that first announcement, Gou has indeed pursued robotics, developing his own robotic arms (or Foxbots as they’re called) to replace humans in his automated factories of the future. But his million robot workforce has yet to materialize. Earlier this year, Foxconn said it was preparing to deploy 10,000 Foxbots costing $20,000 to $25,000 to make iPhones. It was said the robots could produce some 30,000 devices a year and Foxconn would add some 30,000 robots annually. 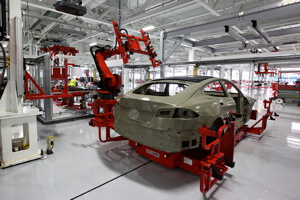 Car assembly has long been automated, but some manufacturing still requires a human touch. It isn’t a million robots, but would represent a pretty serious challenge to human workers if accurate and scaleable. To date, the reason factories like Foxconn’s aren’t fully automated is because robots are unable to match the dexterity of human hands and lack the judgement to perform quality control checks on the assembly line. But instead of the bots driving mass layoffs, the firm reportedly hired a record 100,000 human workers to cope with demand for the latest iPhone. Further, the robots, it was said, would merely assist existing human workers, not replace them. And then it surfaced that Gou was dissatisfied with his first generation Foxbots. They were not up to snuff in terms of proficiency and flexibility. Generation two is forthcoming. But it’s apparent Gou’s million robot revolution is nowhere in sight. So who cares if a CEO made an overexuberant forecast? For one, too often big claims make headlines and aren’t scrutinized down the road to see how well they hold up. But there’s another good reason to keep checking in on Gou’s Foxbots. In the past, we’ve written about worries that robots will replace humans and cause structural unemployment—that is, non-cyclical long-term joblessness. To a degree, Foxconn’s progress represents an early benchmark for such concerns. Here we have a manufacturing giant with every reason to pour resources into automation. They’ve had three years to develop robots dexterous enough to maneuver circuit boards, place touch screens, and generally automate processes. 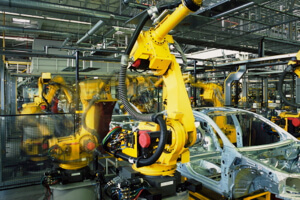 Most factory robots still require precisely programmed conditions to work. The task, however, has proven more difficult than it first appeared, the development has been slower, and human-level performance harder to match. Further, the number of bots is less than promised by two orders of magnitude, and the number of human workers required isn’t down at all—in fact, at least for now, it’s rising. I don’t take this as evidence the robot revolution won’t happen. Or that it’ll be much slower than expected. But I do think it offers insight into how hard robotics still is—particularly when it comes to physical tasks humans can do without blinking an eye. Common wisdom has it that the first wave of robots automated manual and physical tasks. But that’s not quite right. There is are still a significant number of manual and physical jobs that are much more easily and cost-effectively performed by humans. This class of labor includes any job that is unpredictable from one iteration to the next. Such labor might require the worker see and react to a changing environment, to move their position and carefully perform the task from a different orientation, to sort objects of varying size and shape, or to make judgment calls on inspection. Today’s robots, for example, could never build a house on their own. However, although robots aren’t capable of such feats yet—they likely will be in the future. For example, computer vision, a key component necessary for recognizing and adapting to changing environments, is progressing at a rapid clip currently. 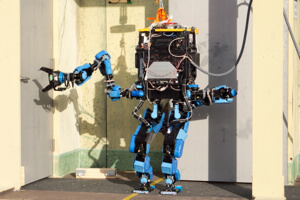 Team Schaft’s robot opening a door at the 2013 Darpa Robotics Challenge trials. The accuracy with which machines can look at a picture or video feed and recognize what they see doubled in the last year. Already there are robots, like the one made by Google-acquisition Industrial Perception, that can look at a stack of haphazardly stacked boxes, recognize their orientations, and decide how best to pick them up. The robots taking part in the DARPA Robotics Challenge still readily show their limitations—but they also show how much is within reach in the coming years. Challenges include opening doors, driving cars, and using tools made for humans. Even so, I wonder if intelligent programs may, counterintuitively, replace many jobs of the mind before robots take over all manual and “unskilled” labor—in AI and robotics, the latter problem has pretty consistently proven the harder nut to crack. The creators of Siri, for example, are hard at work on a new digital assistant that some experts say is the future of intelligent agents. And they’re not alone—Google and Facebook have been collecting AI experts like baseball cards in recent years. Intelligent, natural language software will be useful on a smartphone or in an automated home—but it could also mark the end of call centers in India or China. 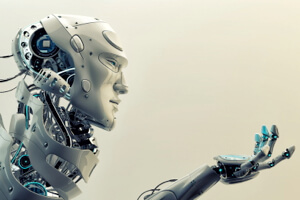 Robot writers are already constructing formulaic earnings reports and sports recaps. It’s not a terribly far reach to find them searching out multiple primary sources, parsing them for facts, and blogging secondary news articles. Watson’s natural language processing abilities already approximate such a process. What about the ultimate extrapolation, where robots do everything humans do only much better? That isn’t in sight yet. But it’s certainly conceivable in the coming years. So if robots and artificial intelligence match and then thoroughly whip humans at their own game—what then? That is the billion dollar question with no answer. Some predict a leisure society, some mass unemployment and misery. But why utopia or dystopia? Perhaps it will simply be the real world. A rocky transition in the short run—as we’ve seen in historical episodes of steep productivity gains—and a new economy later on, complete with a wide variety of jobs we simply can’t imagine right now.